Spectral Optics provide high-quality dielectric coated laser mirrors for use with high power/energy and or ultra-fast lasers from UV to IR spectral ranges. Most dielectric coated laser mirrors that Spectral Optics provide guarantee the state of art damage threshold and the maximum reflectance available. Standard Laser Mirrors cover the most popular wavelengths being used in various laser applications, including high energy eximer lasers, high energy gas lasers, high power ND:YAG lasers, high performance diode lasers, and ultrafast Ti:Sapphire lasers. Some invisible laser applications require a tracer for aligning optics in the setup. Also some Nd:YAG laser applications need to reflect a dual wavelengths together. The laser mirrors for dual wavelengths are perfect solutions for these requirements. In case of some 45˚ mirrors, especially for deep UV applications, the dielectric coating material begins to absorb and reduce the reflectance. In these applications, the right angle prism mirrors are perfect alternative solutions to replace the regular plate mirrors. They're using total internal reflection so there's no worry about losing a power. And the anti-reflection coatings are using only a couple coating layers and can minimize the absorption. The broadband dielectric mirrors are the best solution to maximize the reflection for a certain range that regular metal coating can't achieve. Some special applications need unusual requirements to pick out a specific harmonic or spoil a parasitic laser line. 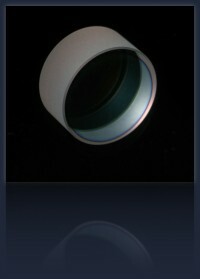 Spectral Optics can find a coating configuration and provide exotic mirrors that will solve the problems.